The Garda Síochána Inspectorate today published a report, "Roads Policing - Review and Recommendations." The report is the result of a comprehensive assessment of the Garda Síochána's commitment and performance in the area of roads policing. It follows detailed research and widespread consultation with the Garda Síochána at all ranks, the Garda representative associations, the Department of Justice, Equality and Law Reform, the Department of Transport, the Road Safety Authority, the Medical Bureau of Road Safety and the Association of City and County Managers. The Inspectorate team also met with Mothers Against Drink Driving (MADD), Co-operation and Working Together (CAWT) and Public Against Road Carnage (PARC). This inspection was undertaken in collaboration with Criminal Justice Inspection Northern Ireland (CJI) and Her Majesty's Inspectorate of Constabulary (HMIC) who were jointly undertaking a similar roads policing study in Northern Ireland. The field work for this inspection was led by Deputy Chief Inspector Gwen Boniface. Chief Inspector O'Toole said, "I would like to express my sincere thanks to all who provided assistance and input to the inspection team, particularly Criminal Justice Inspection Northern Ireland and Her Majesty's Inspectorate of Constabulary." In summarising the findings, the Chief Inspector said, "The Garda Síochána is achieving much higher visibility and enforcement levels in recent years and is making a very important contribution to greater road safety." The Report includes twenty-five recommendations relating to roads policing operations and administration. The Chief Inspector commented, "It is the Inspectorate's hope that the implementation of these recommendations will further enhance the contribution of the Garda Síochána to the overall road safety effort." As in previous reports, the Inspectorate has placed police officer safety as a key objective of its work. The Inspectorate now recommends that the practice of allowing members to drive on 'Chiefs Permission' should cease and the Garda Síochána should develop a comprehensive driver training programme for members. Additionally, the Inspectorate recommends that new recruit applicants joining the Garda Síochána be required to possess a valid driving license prior to employment and successfully complete a comprehensive police driving course during their probationer training. The Chief Inspector acknowledged the commitment of all of the road safety partner organisations and commented that "A reduction in road deaths and casualties cannot be achieved by the police alone. It requires the coordinated efforts of all road safety partners. The reductions in road deaths and injuries in recent years are indicative of what can be achieved through sustained, purposeful efforts." New Road Traffic Bill may be published in early 2009. The Dail discussed the new Road Traffic and Transport Bill which has been approved by the Cabinet. This new Bill includes reducing our drink drive limit from 80mg of alcohol per 100ml of blood to 50mg..It also proposes reducing limit for learner and professional drivers to 20mg.This will include taxi drivers and truckers. These new limits will require the replacement or recalibration of our roadside breathalysers. Our current intoxilyser machines which are based in Garda stations come to the end of their lifespan at the end of 2009 so these will have to be replaced by the Medical Bureau of Road Safety. Penalty points were introduced in Nov 2002 - yet 6 years later half are still not into law.To date, 36 offences have been enacted with another 33 due to come on stream. And despite the ban on driving unaccompanied while holding a provisional licence being in place, it is not an offence for which points are applied to a licence. 33 of the 69 penalty-point offences in the Government's Road Safety Strategy will not be implemented by a March 2009 deadline. The Department of Transport confirmed that the offences would be phased in over time, meaning that road users could drive a "dangerously defective vehicle", put a car which hasn't passed an NCT onto the road and give "false or misleading information" when applying for a driving licence without gathering points. Other offences include not having a driving licence and driving on bald tyres. While all the offences will incur a fine, and possible court action, no points will be applied. The Road Safety Strategy action 30 states: "Expand the range of road safety-related offences covered by way of penalty points and administrative fines," adding that the deadline for action is the first quarter of 2009. Legislation would have to be drafted to add new offences to the penalty points system. Families of those killed in road crashes have called on the Garda Commissioner to abolish fees for the release of documents relating to the crashes. Relatives must pay €41 for a Garda crash form, and €21 for each witness statement. Susan Gray, founder of the road safety group PARC, said she was writing to the Commissioner after being contacted by families objecting to the fees. "We feel families have gone through enough losing a loved one without getting a big bill.For many families access to those files is crucial to get a full picture of what happened." One reason families of those killed in crashes seek such documents is they offer one of the few avenues to find out what may have caused the crash. A Garda spokesman said the fees were set by the Department of Justice to recoup the cost of providing the documents, and said they were not under review. At its meeting yesterday Government noted a recent report submitted by the Road Safety Authority on research into driving and blood alcohol levels. It was agreed to publish this report, which will be taken into account in drawing up the new road traffic Act. The heads of this new Act will be submitted to Government for approval by the summer with the objective of having the bill drafted and enacted in the second half of this year. 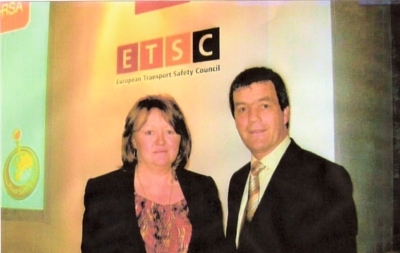 Members of PARC were invited to a joint Road Safety Authority/European Transport Safety Council meeting in Dublin on Friday 18th April to take part in a national debate on road safety in Ireland- what should Ireland further do to drive the flight against drink driving in Europe? Among those speaking at the meeting were Minister for Transport Mr. Noel Dempsey, Antonio Avenoso, ETSC Executive Director, Noel Brett, Chief Executive, RSA, Professor Denis Cusack head of the Medical bureau of road safety, Professor Ray Fuller of Trinity College, and Mr. Eddie Rock, Assistant commissioner. The European Transport Safety Council launched a new report placing Ireland ninth out of 25 EU countries for improvements in road safety. This represents a move of seven places up the safety rankings on Ireland's position in 2005, when the country was ranked sixteenth. But they stressed that we now have to lower the blood alcohol concentration limits and implement the safety camera network as soon as possible. Mr. Dempsey warned against complacency in tackling road safety. Members of our group PARC spoke of our personal losses on the roads and stressed that compulsory testing at collision scenes must be introduced and enforced if we are to have a fair and just system in Ireland- for our dead loved ones, for the grieving families left behind and for the innocent victims who were forgotten…. We argued that road crash statistics for 2003 are at best an underestimate of how many crashes were alcohol related mainly because tests on killed drivers were not available for 25% of them and the vast majority of drivers who survived were not tested. In order to get the true statistics of how many collisions are alcohol related we must have compulsory testing of all drivers involved in collisions where Garda attend. We also brought up the issue of the lack of trained forensic medical experts within the Garda force. It was disclosed during the meeting that only 5% of convicted drivers admit to Insurance companies that they have been convicted which shocked many of us. Are we to accept that many of these drivers may be still driving while legally uninsured? We spoke with Mr. Minister Dempsey on many road safety issues including the massive loophole in border counties where drivers are attending hospitals across the border to avoid being prosecuted for drink driving. He informed us a date has now been set to meet with his counterparts in Northern Ireland on 23rd May to discuss this issue. We found this meeting to be extremely informative while at the same time it gave us the opportunity to speak again with our Minister responsible for the safety of our loved ones on Irish roads. The results of PARC's recent nationwide survey of over 3,000 people supported by Alcohol Action Ireland (AAI) has revealed that 99% of respondents would favour a reduction in the current drink driving level. Even very low levels of alcohol impair your driving ability. The results of this survey clearly demonstrate a growing attitude among people that the current drink driving limits are too high with only 1% of people in support of them as they are. The current drink-driving limit is 80mg for every 100ml of blood. According to those surveyed, almost two thirds of drivers (59%) would favour a reduction in the blood alcohol level to an effective zero*. What is very encouraging here is the high levels of support for zero alcohol tolerance among the younger age groups. Over half of respondents between 17 and 34 believe that the blood alcohol limit should be completely removed. This is a step in the right direction in reducing the number of deaths on our roads as a result of drink driving, and signals a positive change in the attitudes of Irish people to drink driving. The survey was conducted in Locations Donegal, Leitrim, Sligo, Dublin, Wicklow, Wexford, and Cork among 3,262 people with 1,421 male and 1,826 female respondents. It was carried out in the first three weeks of February and conducted through personal contact with members of the public.
. 14% of respondents are in favour of a blood alcohol level of 20mg. *An effective zero takes into account that alcohol is present in some mouthwashes and medication. PARC forwarded the results of this survey on to Mr. Dempsey for his consideration as the survey shows that a great majority (69%) are in favour of a limit of 20mg or less. We will also be informing the RSA so that the expert group will have this information when advising the Minister. What is most important however is that the reduction of the legal limit is both introduced into law and enforced without any further delay and that all necessary equipment is available to the gardai as soon as the new limit comes into force. Road Safety Group PARC recently surveyed over 3,000 people in Ireland on drink driving limits. We are awaiting the results. Only Ireland, UK and Malta have an 80mg limit. All other 24 European Union countries have a 50mg or less BAC limit. Road Crash statistics for 2003 carried out by Dr. Bedford are at best an underestimate of how many crashes were alcohol related mainly because tests on killed drivers were not available for 25% of them and the vast majority of drivers who survived were not tested. If more had been tested the rates would have been higher.14 drivers killed in 2003 were below 80mgs. Above the limit of 20mg there is impairment of driving “ Probably the greatest danger of that first drink is that it impairs our ability to assess our own competence to drive”. After one drink you may not feel intoxicated and may believe you can drive safely. This is due to your brains impaired cognitive processing ability at low blood alcohol levels”. This is why the RSA advert says “Before you decide to drink and drive, take a look at the decisions you may be forcing on others”. Research conducted by the Canadian Traffic Injury Research Foundation found that drivers with blood alcohol levels between 50mg and 80mg were more than seven times as likely to be involved in a fatal crash than drivers with zero alcohol. 1. Drivers’ reaction times and motor skills deteriorate after even a small amount of alcohol- and get worse with increased alcohol consumption. 2. Many drivers who survive a crash are never tested. 3. Scientific evidence does not support the Donegal Coroner’s view that “Drivers who have had one or two pints are not the problem”. 4. The scientific evidence from the USA is overwhelming – “crash rates; increase with any departure from zero BAC” (Moskowitz; H “Epidemiology; of Crashes at low BAC” 2001). 5. There is also evidence to show that reducing the limit from 80 to 50 can have an effect on drivers with very high BACs.Brooks and Zaal evaluated the reduction in the legal limit in the Australian Capital Territory and found that there was a 41% reduction in the incidence of drivers tested with BACs above 150. France also found a pronounced effect for drivers at higher BACs (over 80mg%) when limit reduced from 80 to 50. 6. In 2005, 2147 drivers in the USA with BACs above 0.01 but under the legal limit were involved in fatal crashes. 7. Many drivers believe they are safe to drive if they are below the legal limit. This is a mistake. The risk of being involved in a crash increases in direct proportion to the amount of alcohol consumed, in other words the risk of loss of vehicle control and of collision increases exponentially with BAC. Many PARC members have lost their loved ones in crashes where alcohol was involved. It’s time that the people with vested interests in keeping the alcohol limit at 80mg(0.8) was made aware of the pain that grieving families will have to endure for the rest of their lives because of drink drivers. These families’ lives have been ripped apart. Loved ones who could be here with us today if it wasn’t for the behaviour of others who decided to have a’ few drinks’ and then get behind the wheel and drive. There’s no ‘getting over’ that - no matter how you try…. Your life is ruined forever. We ask the question “Is a ‘ few drinks’ worth the risk of being involved in a crash causing death or serious injury”? Could a driver who has been involved in a crash resulting in the death of another seriously believe that they could reassure the grieving family that because they only had a ‘few drinks’ alcohol played ‘no part’ in the cause of the collision? Try telling that to the children left without a Dad or to the wife left without her loving husband. The vintners are concerned about their livelihoods but surely they must also have concern for the many innocent people dying or being seriously injured on our roads due to drink driving. We must have a creative approach to this problem of rural isolation and there are many solutions but drink driving is not one of them. There are many men and women now widowed as a result of drink driving and many homes where there is loneliness and heartache but we do not hear the vintners concern for these people and their families. There are many others left with horrific injuries for the rest of their lives and are often forgotten. We cannot allow people to drink and drive. The cost is too great. We must create a more caring society in Ireland and many publicans are doing just that by offering to take customers home at the end of the night. “Just one drink impairs driving” is our message for the vintners. The skills most critical to driving-the brains ability to observe, interpret and process information from the eyes and other senses- is impaired by alcohol at the lowest levels that can be measured reliably. (Moskowitz, H. and Burns, M. Effects of alcohol on Driving Performance. Alcohol Health and Research World.) When we say, “never ever drink and drive” that must be reflected in the new drink driving limit. Never ever drink and drive must mean just that. People need a clear message from the Government on drinking and driving. If they are told that they are permitted to have one drink and then get behind the wheel of a car and drive then it is a very wrong and dangerous message that is being sent out. Given our drink driving performance, our frightening road death toll and our inability to control our urge to drive after drinking we urge the Minister for Transport and our Government to decide to send out a clear message to the public and the best deterrent would be that drinking and driving is totally unacceptable. If they are influenced by the drink industry who has such a vested interest in keeping the limit at 80mg then many more innocent victims will needlessly die on our roads and many more will be seriously injured for life. One can still socialise in the pubs in rural areas. We in PARC are not against socialising, we are against drink driving. People in rural areas can socialise all they like as long as they do not drive after taking drink. There are many solutions to the problem of rural isolation but drinking and driving is not and cannot be one of them. In fact the need to have a designated driver could mean that there is more social contact between people than heretofore. People will be forced to make contact with neighbours to arrange lifts from the designated driver. Anyone can drive to the pub for company any night of the week as long as one has a non-alcoholic drink. Rural pubs are already providing transport for patrons in many areas. Road Safety Group PARC members met with Minister Dempsey in Leinster house to discuss our many issues on road safety. He confirmed that he will be introducing legislation for the compulsory testing of all drivers involved in even the slightest collision attended by Gardai. He told us that the Government has decided that in the event of a collision where a driver is seriously injured and taken to hospital there will be provisions put in place to ensure that he/she is tested for alcohol. Wording of the road traffic Act will change. New legislation will say drivers shall be tested rather than may be tested as it stands at present. Gardai 'Forming an opinion' before testing will be dropped. The new bill, will be published before the Dail recesses in July and will concentrate on 2 issues- compulsory testing at collisions scenes and lowering of the drink driving limit. We are really pleased that these two issues are tied together. It shows a great understanding of what is involved. Both are being given top priority by government and will be in legislation and enforced before the end of this year 2008. We brought to his attention the fact that in border counties drivers can easily evade being testing by attending a hospital in Northern Ireland. He was not aware of this and assured us that when he is meeting with his counterpart in Northern Ireland in March/April of this year he will ensure that this will be on his agenda and he thanked us for bringing it to his attention. He believes that the transfer of penalty points between the Republic and Northern Ireland is also an extremely urgent matter and he will do all in his power to bring this about within the shortest possible timeframe. We also brought up the issue of excessive speeding on our roads. At the meeting we handed over our submission on this. PARC is proposing a change in law to ensure that such drivers are charged with dangerous driving which carries a much more fitting penalty than at present. PARC is very pleased with the meeting and we hope that the promised change in legislation will be a reality before the end of the year. This will be the ultimate deterrent to drink driving and unnecessary loss of life. We will continue to keep in touch with the Minister and his department until this piece of legislation is drafted to our satisfaction, passed by both houses of the Oireachtas, signed into power and enforced according to the letter. Then and only then will we be completely happy that the government and ourselves have done a good job. Mr. Dempsey is already half-way there. It will be a great feat for the Minister when this is achieved as he will have shown the courage to act when others shied away.